Cat Island’s western tip marks the approaches to New Orleans, both from seaward and through the Mississippi Sound’s inside passage. Early French explorers gave the island its name, Isle des Chats. As the Mississippi Sound drew increased boat traffic, opinions differed on how to mark the channels in the area. In 1827, Congress had appropriated $5000 for lighthouse construction at Cat Island, but the Fifth Auditor (Lighthouse Authority) let the funds lapse into the surplus fund. During this time, boat packet captains that cruised the water route between New Orleans and Mobile requested a lighthouse be placed at Pass Christian and that a lightship be rigged at the north end of Cat Island. 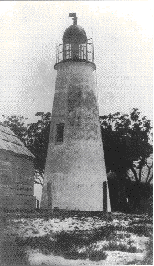 In opposition to the idea was the customs collector at New Orleans, who wanted a lighthouse only, to be placed at the village of Pass Christian. But, it was realized that ships cruising past the Chandeleur Islands would best be served by a light marking the Cat Island anchorage. Therefore, Congress settled the matter by ordering construction of lighthouses at both places. 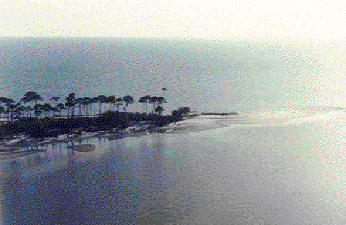 The government recognized the importance of the place, observing that, “All the commerce of the northern Gulf Coast passes through the channels near Cat Island.” So, with that intent, the federal government acquired the Cat Island Lighthouse reservation from Juan Cuevas, who sold the narrow sand spit on the western tip of the island. Congress once more appropriated $5000 in March 1831. The lighthouse was built by Lazarus Baukens, who was hired by prime contractor Winslow Lewis. The station’s first Keeper, George Riolly of Pass Christian, oversaw construction and formally accepted the tower on June 10, 1831, but like the situation with the Pass Christian Lighthouse, the tower was not put to use for several months because of the lack of whale oil fuel. The lighthouse was completed that year showing 10 lamps in 14-inch reflectors on a 34-foot tower base. The Fourth-Order lens was 3 feet above sea level on a whitewashed brick tower, visible for 12-14 miles to sea. The tower was identical in almost every respect to the tower built concurrently at Pass Christian. In 1834, Keeper George Riolly died, leaving a widow who married Ramon, the oldest son of Juan Cuevas. Ramon became the new Lighthouse Keeper with his new bride. In 1846, an outraged lighthouse inspector reported, “Not even a plank upon a neck of land 150 feet wide and 6 feet above the low water mark.” The bricks had simply been laid upon the sand without the thought of any foundation whatsoever. The inspector had found that storm-driven waves had spilled over the spit, washing the base of the tower. The 1846 hurricane had cut a channel between the lighthouse and the remainder of Cat Island. 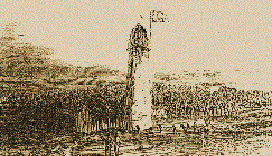 In 1851, the tower stood only a few feet from the water. In 1855, another hurricane fairly demolished the Keeper’s dwelling and left the tower severely periled with the likelihood of toppling down with the next serious blow. A new dwelling was built back from the beach shore protected by a stand of trees and sand dunes. It was also advised that the tower be moved to that location with new funding was asked for. In 1856, Congress appropriated $12,000 – but the tower was not relocated – instead, a new Fresnel lens was installed in 1857, and a new lantern in 1859. With certainty, a September 15th, 1860 storm severely damaged the Cat island tower along with the new keeper’s house. Lightkeeper Ramon Cuevas escaped with his family just before churning seas inundated the island and killed his herd of 30 cattle. Every wharf on the Mississippi coast was destroyed in the storm. During the Civil War the Confederate States Light House Bureau maintained the station until July 1861, when Ramon Cuevas received his final pay in Confederate scrip. The old brick tower barely survived the war with two gaping holes as large as 12 feet in length and a substantial part of its foundation had been markedly eroded. Its lantern was taken down and is still installed in the Tchefuncte River Light tower at Lake Pontchartrain’s northshore. 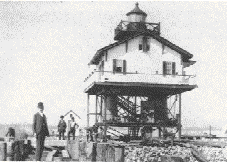 In 1868, the Light-House Board decided to replace the old brick tower with a prefabricated structure upon screwpiles. In July 1871, the new lighthouse arrived in the midst of a Yellow Fever flair-up that had caused the death of many of the laborers there. A square dwelling was raised above the 5 piles. A fixed Fifth-Order lens was elevated 45 feet above the high tides, that was twice the height of the previous brick tower. In September 1871, Sidney Wilkinson received the appointment as keeper – lighting the lamp on December 15, 1871. In 1872, 120-tons of bricks were taken from the old tower and used as rip-rap in order to shore up the tower at St. Joseph Island. By this time, New Orleans bound shipping began using the River passes instead of the Rigolets through Lake Pontchartrain. Following the furious hurricane of October 1893, the N.O. 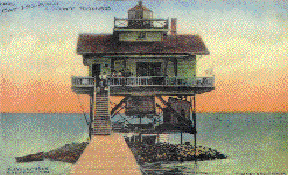 Daily Picayune reported that a relief party had reached Cat Island to find that Lighthouse Keeper J. Clarice and his wife were still attending to the greatly damaged Light. The tower was standing at an angle of about 45 degrees, with about 4 feet of water surrounding its foundation. The only other person on the island at that time was John Duggan, who lived in a house about two miles from the Lighthouse. When the storm came up, Duggan’s house was completely submerged by high water, resulting in his taking refuge in the top of a tree. There he remained in a perilous position for seven hours, until the wind changed and the tide fell. During which time, he was practically skinned alive while retaining his hold on the branches of the tree. The wind had blown with such violence that his skin was torn from his arms, legs, and torso. With no human loss, there was about 200 head of cattle that drowned as the island was inundated. By 1900, The screw-pile light house needed stabilization to its pile foundation so five feet of rock rip-rap was placed around and under the base. On September 22, 1937, the Cat Island Lighthouse was discontinued due to the greatly diminishing number of vessels using the Sound. Word was sent out from the Coast Guard Headquarters that the Federal government had placed the Cat Island Lighthouse for sale by sealed bid. The structure continued to remain sitting idle and abandoned. In 1950, Nathan Boddie, owner of the island, purchased the light from the U.S. government war surplus. Like other isolated structures, it burned down in October 1961, presumed by accident, since it was used by fishermen and hunters who visited the island seeking shelter. As its ashes were washed away by the waves, it remains in memories of the many fishermen who fished nearby.